Harley-Davidson has officially launched the new Street Rod 750 in the Indian market at Rs.5.86 lakh ex-showroom, Delhi. The Street Rod is based on the Street 750 and even shares underpinnings with the Street 750, but sports a new design among other mechanical changes. It is priced Rs. 95,000 over the regular Street 750 and is available in three colour options - Vivid Black, Olive Gold and Charcoal Denim. The Harley-Davidson Street Rod features a new fairing, a split seat design and a new rear panel. 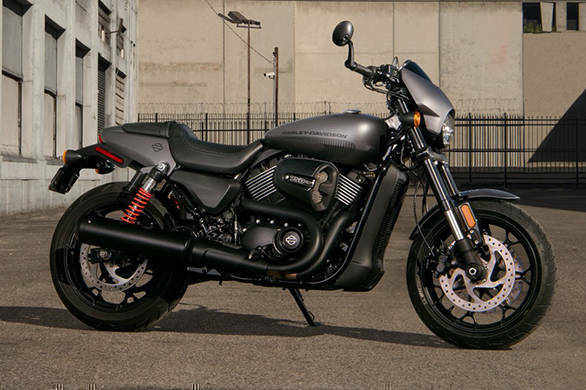 The motorcycle features a slightly different look with Harley-Davidson's Dark Custom styling. Up front, it sports a new windscreen and at the rear a perforated mudguard with newly designed LED lights. Also adding to the design element while taking care of comfort as well, is the increased ride height and ground clearance. The ride height stands at 765mm and ground clearance is 205mm, 60mm more than the Street 750. The wheelbase has been reduced by 10mm to stand at 1,510mm. The front end features rigid 43mm inverted forks and the chassis and steering geometry too has been changed, with the fork rate tightened from 32-degrees to 27-degrees for quicker steering. The lean angles too have increased from 28.5-degrees left and right, to 37.3-degrees right and 40.2-degrees left. The reason we are bombarding our readers with so many figures is that, Harley-Davidson has always claimed that the Street 750 was a responsive motorcycle, but going by the changes to the chassis, suspension and steering on the Street Rod, we are believe that this will be one of the most fun-to-ride Harley-Davidson motorcycles. The biggest change though, is the engine itself. 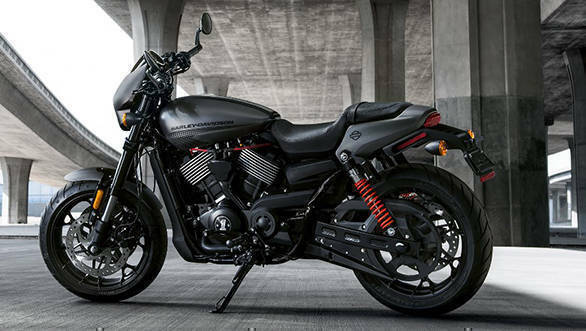 The good folks over at Harley-Davidson have equipped the Street Rod with the liquid-cooled, SOHC, revolution X 750 V-twin engine which according to the company now makes 11 percent more power and five per cent more torque than the Street 750. The compression ratio has gone up from 11.0:1 to 12.0:1 and the engine now redlines at 9,000rpm, 1,000rpm more than it earlier used to. The Street Rod also features an air box with a larger volume, new 42mm throttle bodies, a new 4-valve engine head design equipped with high-lift camshafts and a new exhaust muffler, all of which enable higher flow of air in and out of the engine. Harley-Davidson has also taken safety into consideration, and seem to have acted on what was probably the biggest grouse that riders of the Street 750 had  the brakes. The Street Rod gets a dual 300mm disc brake setup at the front paired with two piston calipers, with ABS as standard. Even though the Street Rod costs Rs. 95,000 more than the Street 750, the new steering and chassis setup, combined with the more powerful engine and better brakes seem to make the Street Rod, a better proposition overall, than the Street 750. Do watch this space for our first ride review where we will confirm if Harley-Davidson has got this motorcycle as right as we think they have.